Barcelona is the capital and most populous city of Catalonia and the second largest city in Spain, with a population of 1,605,602 in 2006. It is located on the Mediterranean coast (41'23''N, 2'11''E), between the mouths of the rivers Llobregat and Besòs, and is limited to the west by the Serra de Collserola ridge (512 m/1,680 ft). Barcelona is a major economic centre, with one of Europe's principal Mediterranean ports. The Port of Barcelona has a 2000-year history and a great contemporary commercial importance. It is the most important Mediterranean port for general cargo of containers and cruisers. The port is managed by the Port Authority of Barcelona. 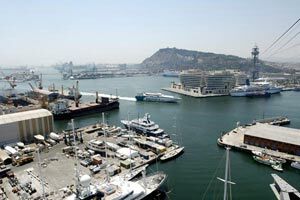 Its 7.86 km (3 sq mi) are divided into three zones: Port Vell (the Old Port), the commercial port and the logistics port (Barcelona Free Port). The port is undergoing an enlargement that will double its size thanks to diverting the mouth of the Llobregat river 2 km (1 mi) to the south.